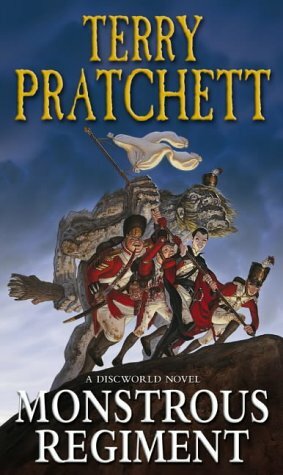 Snuff is the eighth of the Discworld novels about the City Watch by Terry Pratchett [reviews of the others here]. Sam Vimes needs a break. Or at least that’s what his wife Lady Sybil is convinced of. And since she’s very persuasive and has Lord Vetinari’s support, Sam Vimes finds himself carted off to the country with Sybil, their son Young Sam and their butler Wilikins. But despite the tranquility of the Sybil’s country mansion it doesn’t take very long for Vimes’ police instincts to kick in: he is convinced that there is something going on there and he is sure to find out what it is. 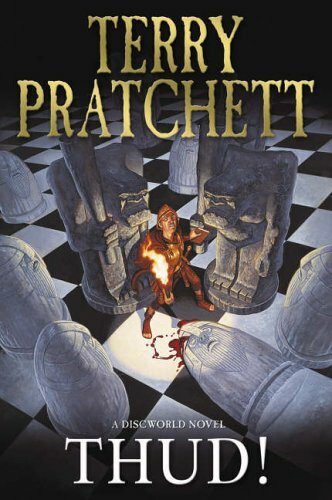 It’s been a while that I read a Discworld novel and I don’t know if it was too long, but in any case, Snuff didn’t work all that well for me, unfortunately. It does have its strengths (and Sam Vimes), but yeah, I would have liked to like it more. Jeremy is the best clock maker there ever was. Which is why he gets approached by the mysterious Lady LeJean to build the perfect clock. What he doesn’t know is that if he actually achieves it, he will manage to capture Time and stop time, leading to the end of the world. So Death, who is a fan of the humans, asks his granddaughter Susan Sto Helit to help with the situation, while the History Monks as well, in the form of Lu-Tze and his apprentice Lobsang, try to prevent the worst. I really enjoyed Thief of Time. It’s well-paced and fun. Plus, I loved the History Monks. Perfectly entertaining. The guild of assassins gets a special assignment: their next target it the Hogfather, right before Hogswatchnight. The guild director hands the task over to Mr. Teatime who is on it with the perfect mix of relentlessness and crazy. Death who notices that things are going wrong, decides to take over for the Hogfather. 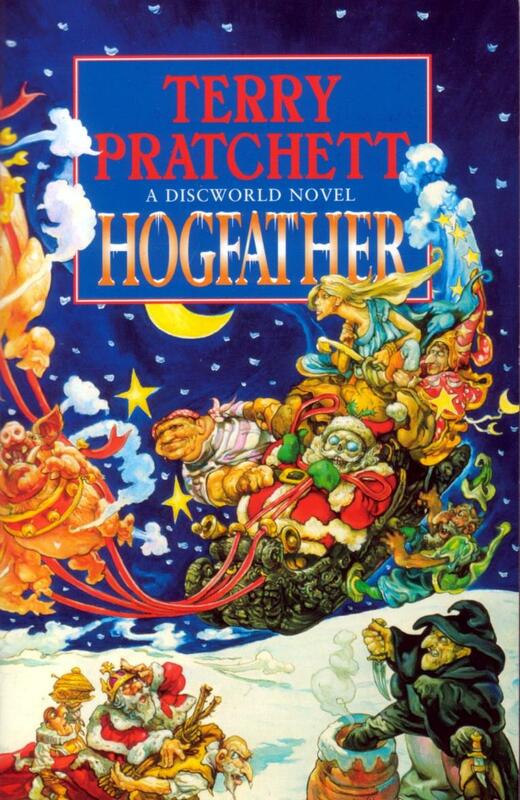 And then Susan – who has taken on a rather quite job of being a governess and would like to keep it that way – also gets involved to save the Hogfather since his death has ramifications nobody could have predicted. 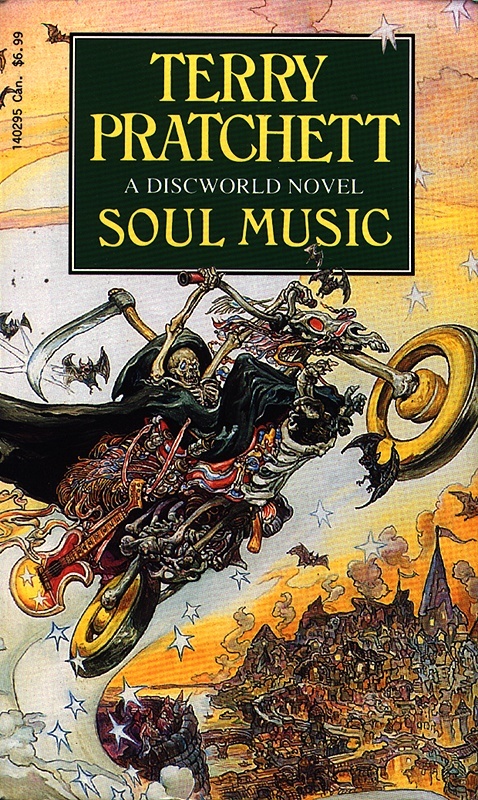 After Soul Music was pretty lukewarm for me, Hogfather again reminded me why I’m still reading the Discworld novels. It’s funny and intelligent. I loved it. Drum Billet is a wizard who knows that he is about to die. So he travels to a small town where the 8th son of an 8th son is about to be born to pass on his powers. 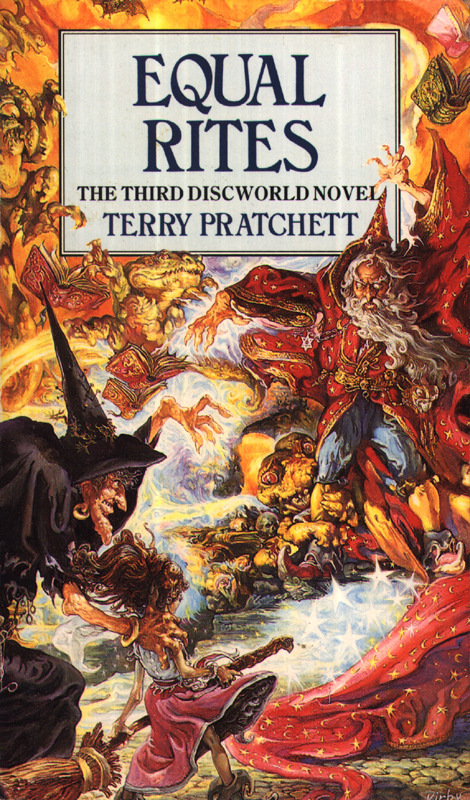 Unfortunatel, neither Drum nor the father listen to the protests of Granny Weatherwax, resident witch and midwife and before she can stop them, the world’s first female wizard is created. Unfortunately nobody really knows what to do with little Esk, since female wizards not only didn’t exist before, but are quite unthinkable – according to lore. So, Granny Weatherwax tries to take Esk’s education upon herself. Equal Rites is nice but it didn’t blow me away. As usual when Pratchett approaches feminism, it’s well-meaning but it doesn’t really work out. The Auditors of Reality think that Death has become too much of a personality t0 continue doing his job, so they sent him away. Unfortunately, they didn’t think about what would happen to the rest of the Discworld when that happens. So while Death uses his skills with a scythe to harvest Mrs. Flitworth’s corn, Windle Poons, recently deceased wizards, fights for his right to actually be dead. But that’s not the only strange thing that happens in the Discworld. 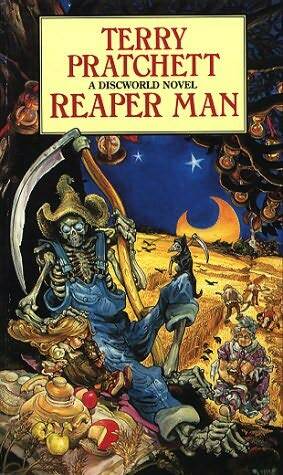 Reaper Man was nice. It just kinda runs its course and its enjoyable, but it’s probably not one of the books that will stick around in my head. Mort is a typical teenager, which means that he has more joints than he should, absolutely no idea about what he wants to do and he’s basically embarassed 24/7. Since nobody really knows what to do with him, Mort gladly accepts when Death offers him an apprenticeship. But when he falls in love with a princess destined to die and Death seems to tire of his job, things start to go awry. The book is nice, but not much more. 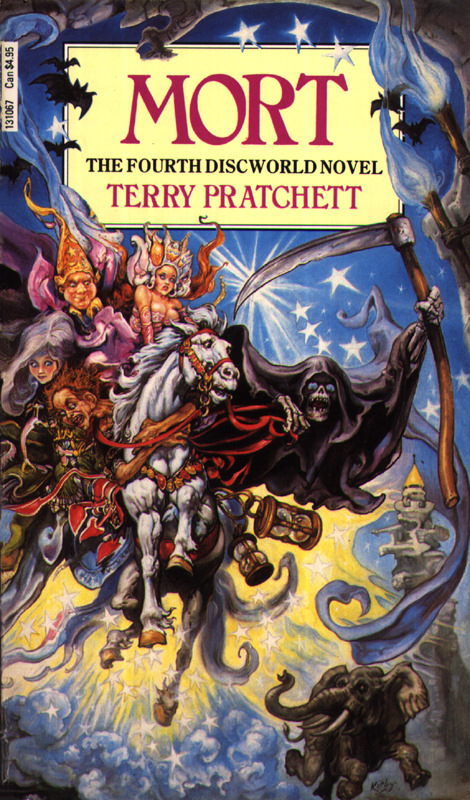 I liked Mort as a character and I just love Death, but it just seemed really obvious where the book was going and Pratchett’s writing wasn’t great, either. Thud! 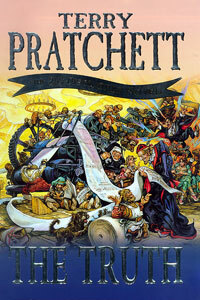 is the seventh of the Discworld novels about the City Watch by Terry Pratchett [reviews of the others here]. The anniversary of the legendary Battle of Koom Valley is approaching, where famously the dwarves ambushed the trolls and the trolls ambushed the dwarves and things in Ankh-Morpork are brewing since it’s the place where dwarves and trolls live closest together. When a dwarf is found dead, with a troll club nearby, Sam Vimes suddenly has his hands full, trying to avert a racial disaster. As in all Pratchett books, there were some really awesome bits. But put altogether, Thud! was quite a let-down after Night Watch. It was the first time, I think, that I was not surprised by a Pratchett plot and the whole vampire vs. werewolf thingy got a little tired. William de Worde makes his living as a kind of news service. He gathers rumours and news around town, compiles a letter once a month which he then tries to sell to as many subscribers (mostly nobility or higher ranking people out of town) as he can. One day he stumbles upon a new dwarf invention – a press with movable type. More or less against his will he is pulled into business with the dwarves and into a msysterious attack the Patrician is said to have committed. And basically before he knows what has happened, William has founded the first Newspaper in the Discworld. The Truth was really enjoyable. 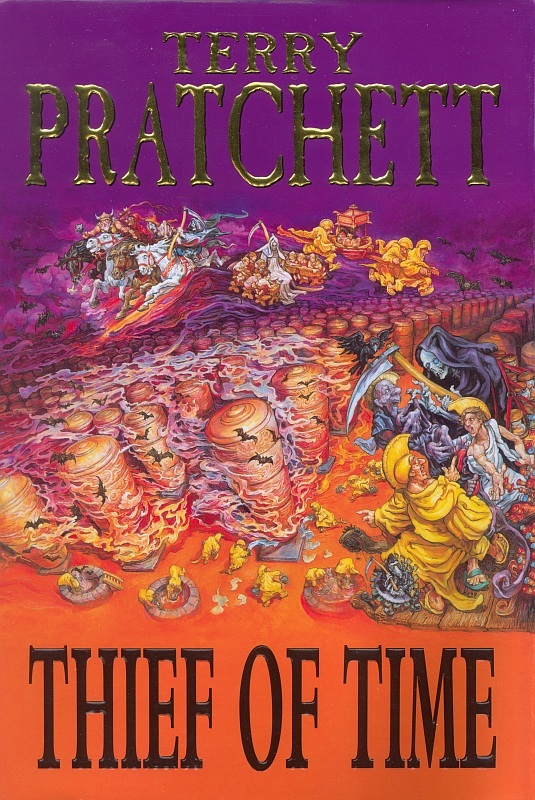 Though probably not the best Discworld novel ever, I had fun reading it, and as the other books, it’s a quick read with loads of ideas (enough for approximately 20 books).